Yellow zinc passivated for corrosion resistance. Single-thread, case-hardened PZD countersunk screws. Includes most popular sizes. Sizes: 3 x 12, 3.5 x 12, 3.5 x 16, 3.5 x 20, 3.5 x 25, 3.5 x 30, 3.5 x 40, 4 x 20, 4 x 25, 4 x 30, 4 x 40, 4 x 45, 4 x 50, 5 x 30, 5 x 50, 5 x 60, 5 x 70, 5 x 80 and 6 x 100. Sturdy case with removable plastic compartments. Zinc-plated for corrosion resistance. Hexagonal drive flange nuts with serrated bearing surface. Protruding flange allows use on irregular or oversized holes. Includes assorted sizes M5 to M12. Handy storage case with compartments. Zinc-plated for corrosion resistance. Integrated nylon insert for tight fitting around thread. Very secure fastening. Includes assorted sizes M4 to M12. 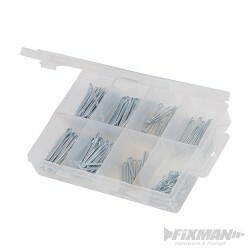 Handy storage case with compartments. Zinc-plated for corrosion resistance. Easily attached and tightened by hand. No tools required. Includes assorted sizes M4 to M12. 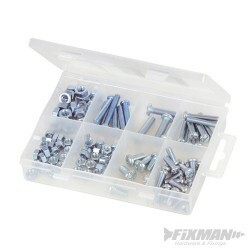 Handy storage case with compartments. Zinc-plated for corrosion resistance. 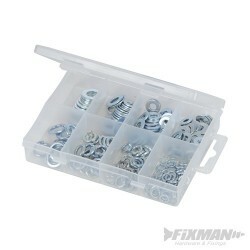 Includes flat and spring washers in assorted sizes M5 to M10. 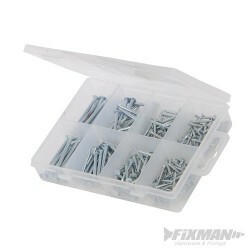 Handy storage case with compartments. Zinc-plated for corrosion resistance. Slotted pan heads. Slotted pan head. 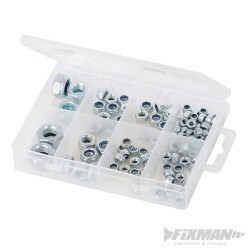 Includes M5 and M6 hex nuts in assorted sizes between M5 x 12 to M6 x 25mm. 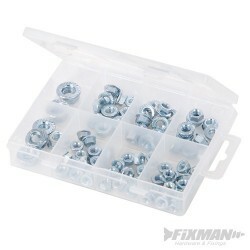 Handy storage case with compartment. Zinc-plated for corrosion resistance. Small, cylindrical head with tall vertical sides. 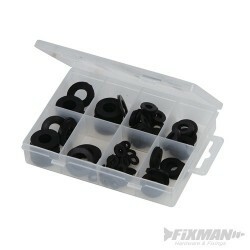 Includes assorted sizes between M5 x 20 to M8 x 30mm. Handy storage case with compartments. 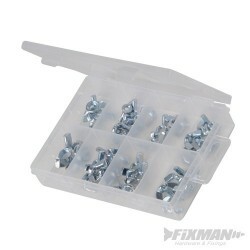 Ring, fork, male and female pre-insulated crimp terminals. High-grade vinyl insulated coating. 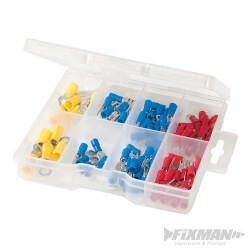 Colour coded: Red 0.4-1mm; Blue 1.1-2.5mm; Yellow 2.6-6.5mm. 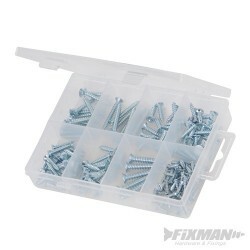 Handy storage case with compartments. Zinc-plated for corrosion resistance. Two tines bend during installation to create secure fixing. 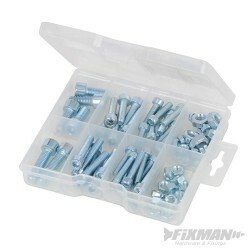 Includes assorted sizes 30 x 2.2, 22 x 2.2, 22 x 1.5, 19 x 1.3 & 10 x 1.3 mm. Removable and reusable fixing. Handy storage case with compartments. Zinc-plated hardened steel. Round shank. For fixing wood to brick, breeze block and most types of masonry. Includes assorted sizes 20 to 40mm. 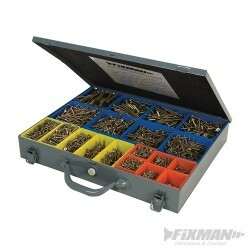 Handy storage case with compartments.